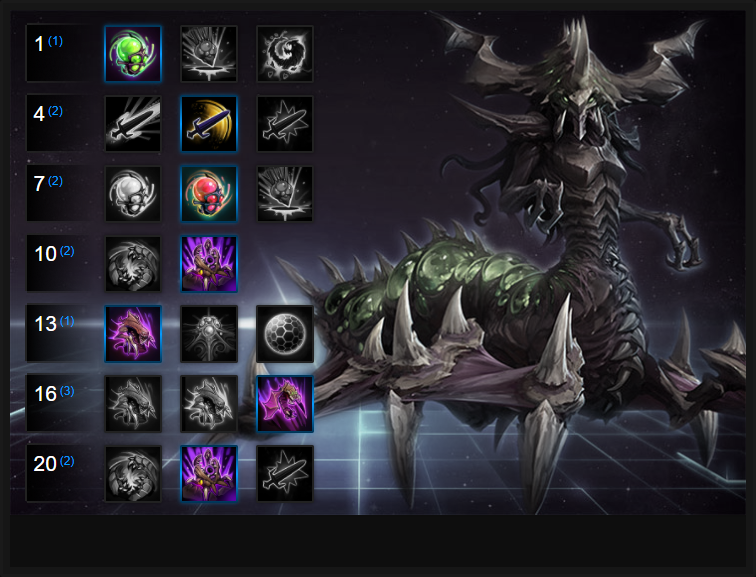 In this Zagara Build Guide, we provide an overview of her strengths, abilities and talents. Zagara is a popular Hero that's strong at pushing lanes. What she lacks in mobilty, she makes up in utility. She can comfortably clear lanes, press towers and in team fights her ultimate ability is incredibly powerful. What makes Zagara useful, even in the current Meta, is her ability to reveal an area. Her trait, Creep Tumor, allows her to cover the ground with Creep that provide useful bonuses for her. When it comes to her role of "lane pushing", she's still one of the best and can comfortably 1 on 1 most enemy Heroes and other Specialists. In the right hands she's also valuable in a team fight due to her ranged prescence. Unfortunately for Zagara she has been pushed out lately by Probius but can still be a challenge to deal with on large Battlegrounds thanks to Nydus Network. Creep Tumor (Trait) – Proper use of Creep is an important part of mastering Zagara. While standing on Creep, she and her summons gain increased attack range, while her and her summons move 20% faster. Although it no longer provides vision, it's invaluable for allowing Zagara to push a large quickly while poking from relative safety. Just be sure you place it somewhere where it won't be killed easily - its cooldown is long at 20 seconds. Baneling Barrage (Q) – With a very low cooldown but firing only one Baeling, Baneling Barrage is cheap and your primary method of wave push. Baneling Barrage allows you to constantly shove the minion wave and threaten towers earlier than many other Heroes. Just be aware that you are rooted and unable to use your basic attacks while using this ability, so make sure you’re aware of your surroundings. Due to its cheap mana cost, use it as much as possible to bully a lane. Hunter Killer (W) – This Hydralisk will quickly become your best friend. It’s a targeted ability, and once used, your minion will relentlessly chase and attack your target. With a fairly large health pool and damaging attacks, the Hydralisk can be a nuisance to deal with for your opponents. With a manageable mana cost, this ability should be used frequently as it's great for zoning out enemy players. Infested Drop (E) – It’s not a huge amount, but the poke damage from the impact of the drop isn’t entirely insignificant, and can be useful for stopping enemies from taking objectives such as capturing tributes or turning in coins on Blackheart’s Bay. The Roachlings can also be used to block damage and tank tower shots, which can certainly be useful. It’s still worth using this ability during team fights, though it won’t be a tremendous source of damage. Devouring Maw (R) – Speaking of team fights, this ability is absolutely monstrous when enemies are grouped up. Not only will it make any foe caught in it unable to take action, they’ll also take a fair bit of damage as well. Maw will allow you to split up a team and eliminate the remaining targets, and also makes landing AoE abilities a breeze, as the enemies that were swallowed will be released close together when the ability is done. Nydus Network (R) – This is Zagara’s answer to mobility. When you cast a Nydus Network, your Creep will spread 15% further. In addition, all basic attacks reduce your cooldowns by 0.75 seconds. If you have vision and Creep down, you can summon a Nydus Network on it. Entering it allows you to travel to another and while inside you regenerate almost 10% of your health and mana per second. It effectively allows you to fast travel around the map with ease, while sustaining yourself if you've taken damage. Providing Zagara with splash damage, Medusa Blades causes her basic attacks to deal 33% damage against nearby enemies. For clearing waves, it's pretty amazing and it's not too bad in a team fight either. Variable: For a high single target damage article, Envenomed Spines provides a brilliant boost to your basic attack by providing a high damage over time effect to your opponent. It's great for poking other Heroes and taking down towers from a safe distance but does have a lengthy 30 second cooldown. Viscious Acid provides Zagara with some much needed crowd control, allowing her to slow enemies hit by her Baneling's by 20% for 1.5 seconds. It doesn't sound a lot, but does allow her to zip away from enemies when she stutter-steps her attacks. Variable: When you need significant amounts of poke, take Baneling Massacre. It allows Zagara to gain two additional charges, allowing her to bombard the enemy team or lane with ease. It's amazing for pressuring from afar, especially with the additional range. Providing huge amounts of global presence, combined with buffs to Zagara's Creep while also offering her tons of sustain, Nydus Network is a no-brainer. Hydralisk Transfusion provides health back to Zagara based on 75% of the damage the Hydralisk deals. Considering its output is around 150 damage per second, for 8 seconds, that's a return of over 500 health. Mutalisk's are incredibly annoying. They fly, they deal reasonable damage and they follow enemy players for what seems like forever. Taking this talent allows your Hunter Killer to spawn one, providing you with a bit of extra damage and nuisance power. Best of all, Mutalisks last forever. Endless Creep makes your Creep Tumor effectively global, allowing you to place it anywhere. Once you have, you can then place your Nydalus Network. In addition, Creep now lasts for 600 seconds and grants a 20% movement speed increase. Variable: If you're going solely for lane push, take Fury of the Storm. Its bonus damage against players and minions is huge and allows you to quickly clear lanes or deal extra pressure. These Hero Threat Levels (1 being lowest threat and 10 being highest threat) are to help you determine which enemy Heroes can give you a headache. For the Heroes listed here, take extra care as they're particularly dangerous for Zagara. Genji: He can chase you with ease, deflect your main attacks and cut you down the moment you get low. Jaina: If you avoid her Cone of Cold and Blizzard (fairly tricky) she's incredibly easy to bring down. If she snares you however, it's game over. Kael'Thas: It's possible to beat Kael because he's so squishy but if he catches you in his Gravity Lapse, you'll likely die. Nova: A nightmare to kill because if she hits you with her burst, you're almost dead. If she doesn't, it's easy to keep her out of stealth with Hunter Killer and a well timed Infested Drop. Sylvanus: Your extended range combined with Infested Drop make it easy to poke Sylvanus out. Thrall: Self healing, a root and a ranged attack, Thrall is a real threat and if he catches you, he'll deal huge damage with Wind Fury. The Butcher: If caught by his Onslaught, you'll rarely get away due to him slowing you. If he has Lamb to the Slaughter, you're doomed. Valla: A really tough matchup if she has her Multishot talented to snare. If she doesn't, it's still tricky if she's pursuing a basic attack damage build. Try to pressure her with Hunter Killer's and your Banelings. Zeratul: His cloak, burst damage, ability to slow and Void Prison (should he need) make him a huge threal to Zeratul. This list of tips and tricks are just a handful of things we think will help your Zagara play. We'll continue to add to the list as required and if you have any tips you'd like to share, let us know in the comments below and we'll place them here. 1. Your Trait is on a long cooldown and needs placing carefully. It no longer provides vision but a variety of buffs to help you push lanes. Use it to pressure the enemy and bully their lane. 2. Nydus Network can be killed, so be sure to place it in hidden locations that you can easily reach to replenish health and mana. 3. Use your Baneling Barrage against enemy towers while your lane minions keep the opposing minions distracted. You should be able to get one or two off before a new wave arrives. 4. Infested Drop does good damage and is great at poking enemy Heroes who are in your lane. 5. You're incredibly vulnerable to cloaking Heroes. Don't over extend. 6. If possible, try to maintain as many Mutalisk's as possible. Each Hunter Killer spawns one. 7. Try to always stay on the edges of a fight as you're very vulnerable if caught in melee range. 8. Try to use Infested Drop and your Hunter Killer's on priority targets (healers) so that they're forced to deal with them. 9. Use your Nydus Network to constantly out-lane the enemy. Start at top, move to bottom, and then back to the top. You'll push waves easily and the enemy will struggle to keep up. 10. Zagara after her rework isn't as offensive in team fights as she once was. She's a pure specialist but can still deal solid damage from afar.